Many spiritual commentators have likened the process of Ascension as a form of rebirth in that it is the death of the Separate Self to enable the rebirth of the Eternal Self. This process of dying and being reborn takes place while we are still alive and remaining in our human forms and for those who have journeyed through a ‘dark night of the soul’, the deep cleansing of our human energy, there would be empathy with this analogy. But as we edge closer to merging with our Sacred Self, we occasionally experience uncomfortable phases when we are neither here nor there but somewhere deep in the void of nowhere. I’ve come to understand these periods as times when we are given the chance to integrate all we have gained to rebalance ourselves before the next big influx of movement. But when we’ve become used to the clarity that comes with higher levels of Light, it can be difficult to adjust to what feels like prescribed periods of dimness, where all seems subdued and murky, leaving us confused and unsure what to do and feeling like we’re slipping back into the shadows. We aren’t, of course, if anything these feelings are showing us how far we’ve travelled. But as we now move into a new watery energy, with the Sun in Scorpio and the Moon moving through Cancer, I’ve found myself being pulled by the deepness of the sea. I need to be near water, craving ocean waves and listening to the sounds of whale songs. 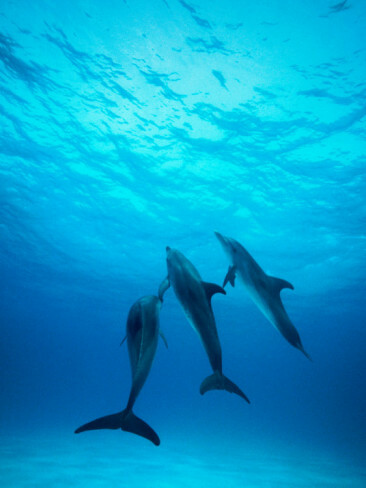 I’m having visions of being underwater where dolphins are appearing in my meditations with the message that the sea holds the key to our freedom in that there is clarity in water. I’ve allowed myself to be carried by the currents of blue light, where I’ve found healing from the sounds of the deep. This flood of watery energy could represent the ‘breaking of the waters’ in our rebirthing process, reminding us that we have not been abandoned but in fact are as close as we’ve ever been to this new life in this new world. We are floating between worlds now and if we allow ourselves to fully let go we can feel the support of the energy around us just as water supports us out at sea. By immersing ourselves fully into our bodies we can feel the last of the resistance dissolve and just as the dolphins and whales, our spiritual siblings, glide effortlessly through their watery world, so too will we be carried by these currents towards the Sacred Light of the new.